Bienvenue! Joyeux Anniversaire! BON APPÉTIT! | eat. cook. blog. Bienvenue! Joyeux Anniversaire! BON APPÉTIT! Or…Welcome! Happy Birthday! Happy Eating! 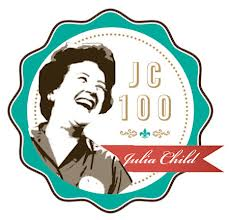 This month we celebrate Julia Child’s birthday. Today, August 15, she would have been 100 years old. Julia is such an icon in the cooking world and I’ve been playing around with and trying to set up this blog for a while now**, so decided that her birthday would be the perfect day to officially launch it. So, in honor of Julia…Welcome to Eat.Cook.Blog! I admit that up until now, I had never actually made one of Julia’s recipes and am ashamed to say that I don’t even own one of her cookbooks. Mon dieu! I do, however, have a Salade Niçoise recipe that I’ve been making forever. 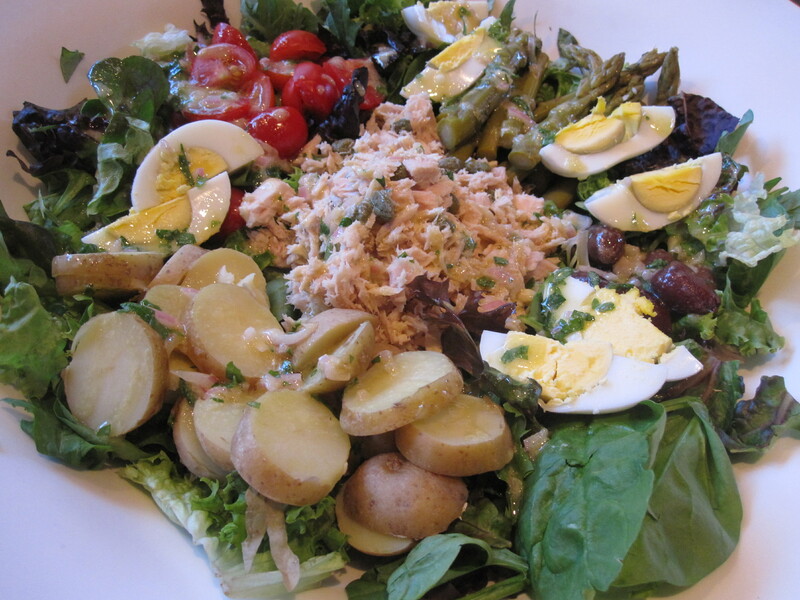 Inspired by the JC100 celebration (all kinds of events, including restaurants across the country featuring Julia’s menus), I looked up Julia’s Niçoise recipe and noticed its not too different from my own. I do like her vinaigrette better, so I’ve adapted my version a bit to include her recipe. Line a large, wide salad bowl or a roomy platter with lettuce. Drain the tuna, flake and in a medium bowl, toss with about a tablespoon of olive oil, the capers and a little caper brine. Decoratively mound the tuna, the beans, potatoes, tomatoes and olives, separately, on the lettuce on the platter. Garnish with the hard-boiled egg wedges and then sprinkle chopped parsley over everything. I usually let the whole thing chill in the fridge while I make the vinaigrette. Shake all of the ingredients together in a screw-topped jar. Drizzle the vinaigrette over the chilled salad. So why stop here with my homage to Julia? Given that we have an over abundance of cherry tomatoes in our garden, I also discovered her Provençal Tomatoes. 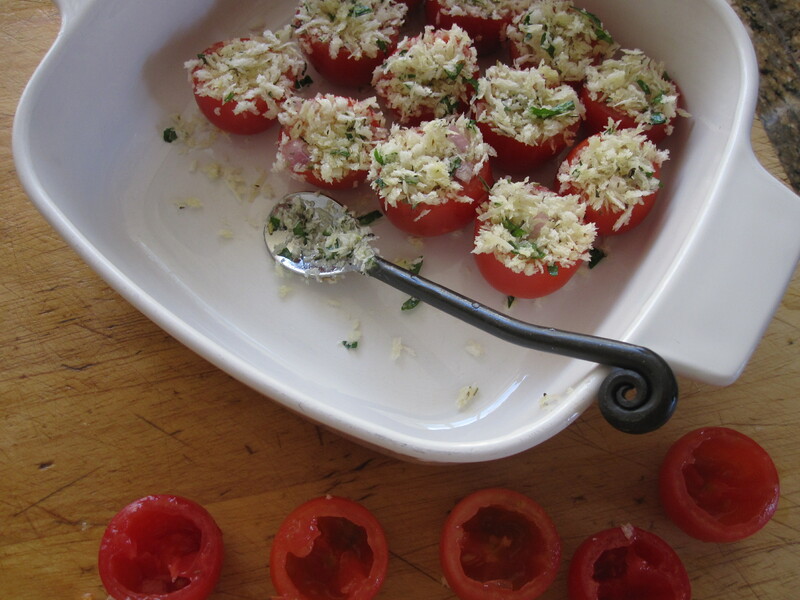 I used her original recipe and adapted it for our cherry tomatoes and served them as an appetizer. In the words of Julia (and Dale), BON APPÉTIT! Cut about 1/2″ off the top of the tomatoes (and, if necessary, a little bit off the bottom, so they stand upright). With a small spoon or melon baller, gently scoop our the inside of the tomatoes. Place them in a shallow baking dish, and sprinkle with salt and pepper. In a bowl, stir together the bread crumbs, shallots, dried herbs, grated cheese and chopped parsley. Add 2 to 3 tablespoons of the olive oil, tossing well to moisten the crumbs evenly. Spoon the filling into the tomatoes, pushing it down into the cavities and mounding on top. Drizzle a scant teaspoon of oil over the top of each half. Bake the tomatoes for 10-15 minutes, or until the topping has browned and the tomatoes are hot but still keep their shape. Serve hot in the baking dish, or move them carefully to a clean platter. **I would be remiss to not thank Deprise Brazel and Leah Singer for all their help in tutoring me in WordPress. (Truth be told, Leah actually did most of the work in getting it set up!) Merci.